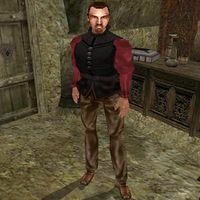 Lucretinaus Olcinius is an Imperial trader who runs a shop in the northwestern corner of Vivec's St. Delyn canton plaza. His son, Cassius Olcinius has run into trouble with a local wizard, Fevyn Ralen, who cursed him with permanent Invisibility. You may be able to sort out this tangle for them. Cassius Olcinius: [75 Gold has been added to your inventory] "My son is what??? That explains why I haven't seen him for days. He's a good boy, just a bit out of touch with things. I really appreciate you helping him out here. I'd do it myself, but I really can't take the time to leave the store. Here, take this to help you along." Fevyn Ralen: "Fevyn isn't a bad sort, for one of those wizards. From what I hear, he does an excellent job, but his prices can be rather steep." This page was last modified on 15 February 2015, at 15:14.